1 English and Indonesian are recognised by the Constitution as " working languages". 3 Additionally, centavo coins are also used. East Timor, officially the Democratic Republic of Timor-Leste, is a country in Southeast Asia comprising the eastern half of the island of Timor, the nearby islands of Atauro and Jaco, and Oecussi-Ambeno, an exclave on the northwestern side of the island, within Indonesian West Timor. The small country of 5,376 square miles (14,609 square kilometres) is located about 400 miles (640 km) northwest of Darwin, Australia. The name Timor derives from timor or timur, the word for 'east' in Malay as well as Indonesian, which became Timor in Portuguese. The Portuguese name Timor-Leste ( pron. IPA: [ti'moɾ 'lɛʃtɨ]) and the Tetum name Timor Lorosa'e are sometimes used in English. Lorosa'e (the word for 'east' in Tetum) literally means 'rising sun'. East Timor has the lowest per capita GDP (Purchasing Power Parity adjusted) in the world, of only $400 (which corresponds to the 192nd position). However, on its Human Development Index, or HDI, it is in 142nd place among the world's nations, which corresponds to medium human development. 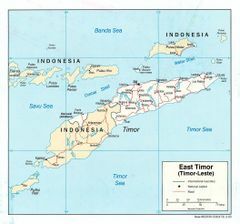 Colonized by Portugal in the 16th century, East Timor was known as Portuguese Timor for centuries. It was invaded by Indonesia in 1975, which occupied it until 1999. Following the UN-sponsored act of self-determination that year, Indonesia relinquished control of the territory, which achieved full independence on May 20, 2002, becoming the first new country of the 21st century. With the Philippines, East Timor is one of only two predominantly Roman Catholic countries in Asia, and the only Portuguese-speaking sovereign state in Asia. Timor was originally populated as part of the human migrations that have shaped Australasia more generally. It is believed that survivors from at least three waves of migration still live in the country. The first were related to the principal indigenous groups of New Guinea and Australia, and arrived before 40,000 years ago. Around 3000 BC, a second migration brought Austronesians, who later continued eastward and colonized Island Oceania, and are possibly associated with the development of agriculture on Timor. Finally, proto- Malays arrived from south China and north Indochina. The mountainous nature of the country meant that these groups could remain separate, and explains why there is so much linguistic diversity in East Timor today. Timor was incorporated into Chinese and Indian trading networks of the 14th Century as an exporter of aromatic sandalwood, slaves, honey and wax. Early European explorers report that the island had a number of small chiefdoms or princedoms in the early 16th century. One of the most significant is the Wehale kingdom in central Timor, with its capital at Laran, West Timor, to which the Tetum, Bunaq and Kemak ethnic groups were aligned. The Portuguese were the first Europeans to colonise South-East Asia when they arrived in the 16th century. They established outposts in Timor as well as in several of the surrounding islands. However, during the House of Habsburg's rule over Portugal, all the surrounding outposts were lost and eventually came under Dutch control by the mid 17th century. The area became a colony in 1702 with the arrival of the first governor from Lisbon. In the 18th century, the Netherlands gained a foothold on the Western half of the island, and was formally given West Timor in 1859 through the Treaty of Lisbon. The definitive border was established by the Hague Treaty of 1916, and it remains the international boundary between the successor states East Timor and Indonesia. In late 1941 Portuguese Timor was briefly occupied by Dutch and Australian troops, who aimed to thwart the Japanese invasion of the island. The Portuguese Governor protested the invasion, and the Dutch forces returned to the Dutch side of the island. When the Japanese landed and drove the small Australian force out of Dili, the mountainous interior became the scene of a guerrilla campaign, known as the Battle of Timor, waged by Allied forces and Timorese volunteers against the Japanese. The struggle resulted in the deaths of between 40,000 and 70,000 Timorese. Following the end of the war, Portuguese control was reinstated. The process of decolonisation in Portuguese Timor began in 1974, following the change of government in Portugal in the wake of the Carnation Revolution. Owing to political instability and more pressing concerns with decolonisation in Angola and Mozambique, Portugal effectively abandoned East Timor, which unilaterally declared itself independent on November 28, 1975. Nine days later, it was invaded and occupied by Indonesian forces before the declaration could be internationally recognised. Indonesia alleged that the popular East Timorese FRETILIN party, which received some vocal support from the People's Republic of China, was communist. With the American cause in South Vietnam lost and fearing a Communist domino effect in Southeast Asia, the U.S., along with their ally Australia, supported the pro-Western Indonesian government's actions, despite Portugal being a founding member of NATO. An Indonesian invasion was launched over the western border on 7 December 1975. The day before the invasion of Dili and subsequent annexation, U.S. President Gerald Ford and Secretary of State Henry Kissinger met President Suharto in Jakarta where Ford made it clear that "we will not press you on the issue." U.S. arms sales to Indonesia continued under subsequent U.S administrations including that of Bill Clinton, although it did eventually discontinue U.S. support of Suharto's regime. The territory was declared the 27th province of Indonesia in July 1976 as Timor Timur. Its nominal status in the UN remained that of a "non-self-governing territory under Portuguese administration." The East Timorese guerrilla force, Falintil, fought a campaign against the Indonesian forces from 1975 to 1999. Their casualties were relatively light compared to those they inflicted upon the Indonesian military. Indonesian rule in East Timor was often marked by extreme violence and brutality, such as the Dili massacre and the Liquiçá Church Massacre. In addition, subsistence agriculture, food, and medical supplies were deliberately obstructed, resulting in heavy excess mortality. From 1975 until 1993, attacks on civilian populations were only nominally reported in the Western press. Death tolls reported during the occupation varied from 60,000 to 200,000 . A detailed statistical report prepared for the Commission for Reception, Truth and Reconciliation in East Timor cited a lower range of 102,800 conflict-related deaths in the period 1974-1999, namely, approximately 18,600 killings and 84,200 'excess' deaths from hunger and illness. Since each data source used under-reports actual deaths, this is considered a minimum. Amnesty International estimated deaths at 200,000 . Following a UN-sponsored agreement between Indonesia, Portugal and the US; as well as a surprise decision by the Indonesian President B. J. Habibie, on August 30, 1999, a United Nations-supervised popular referendum was held. The East Timorese voted for full independence from Indonesia, but violent clashes, instigated primarily by the Indonesian military (see Scorched Earth Operation) and aided by Timorese pro-Indonesia militias, led by Eurico Guiterres, broke out soon afterwards. A peacekeeping force ( INTERFET, led by Australia) intervened to restore order. Militias fled across the border into Indonesia, from which they attempted sporadic armed raids, particularly along the New Zealand Army-held southern half of the main border. As these raids were repelled and international moral opinion forced Indonesia to withdraw tacit support, the militias dispersed. INTERFET was replaced by a UN force of International Police, the mission became known as UNTAET, and the UNTAET Crime Scene Detachment was formed to investigate alleged atrocities. The result of these actions caused Osama Bin Laden to place a fatwa on Australia and Australian interests. Independence was recognised by Portugal after a visit of Xanana Gusmão to Lisbon to choose the date. They decided May 20, 2002, and East Timor joined the UN on September 27 of that year. Unrest started in the country in April 2006 following the riots in Dili. A rally in support of 591 East Timorese soldiers, who were dismissed for deserting their barracks, turned into rioting where five people were killed and over 20,000 fled their homes. Fierce fighting between pro-government troops and disaffected Falintil troops broke out in May 2006 . While unclear, the motives behind the fighting appeared to be the distribution of oil funds and the poor organization of the Timorese army and police, including former Indonesian police and former Timorese rebels. Prime Minister Mari Alkatiri called the violence a "coup" and welcomed offers of foreign military assistance from several nations . By May 25, 2006, Australia, Malaysia, New Zealand, and Portugal sent troops to Timor, attempting to quell the violence . On June 21, 2006, President Xanana Gusmão formally requested Prime Minister Mari Alkatiri to step down. A majority of Fretlin party members had demanded the prime minister's resignation, accusing him of lying about distributing weapons to civilians . On June 26, 2006 Prime Minister Mari Alkatiri resigned stating, "I declare I am ready to resign my position as prime minister of the government... so as to avoid the resignation of His Excellency the President of the Republic" . José Ramos Horta was appointed as his successor on July 8, 2006. The Head of state of the East Timorese republic is the president, who is elected by popular vote for a five-year term. Although the role is largely symbolic, the president does have veto power over certain types of legislation. Following elections, the president appoints the leader of the majority party or majority coalition as the prime minister. As head of government, the prime minister presides over the Council of State or cabinet. 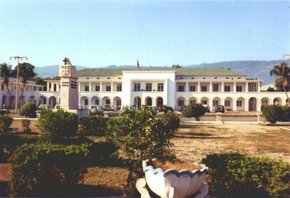 The unicameral Timorese parliament is the National Parliament or Parlamento Nacional, whose members are elected by popular vote to a five-year term. The number of seats can vary from a minimum of 52 to a maximum of 65, though it exceptionally has 88 members at present, due to this being its first term of office. The East Timorese constitution was modelled on that of Portugal. The country is still in the process of building its administration and governmental institutions. The island of Timor is part of the Malay archipelago and the largest and easternmost of the Lesser Sunda Islands. To the north of the mountainous island are the Ombai Strait and Wetar Strait, to the south the Timor Sea separates the island from Australia, while to the west lies the Indonesian Province of East Nusa Tenggara. The highest point of East Timor is Mount Ramelau (also known as Mount Tatamailau) at 2,963 meters (9,721 ft). The local climate is tropical and generally hot and humid, characterised by distinct rainy and dry seasons. The capital, largest city and main port is Dili, and the second-largest city is the eastern town of Baucau. Dili has the only functioning international airport, though there are airstrips in Baucau and Oecusse used for domestic flights. Dili's airport runway is unable to accommodate large aircraft (upto a 737 or a C-130). Prior to and during colonisation, Timor was best known for its sandalwood. In late 1999, about 70% of the economic infrastructure of East Timor was laid waste by Indonesian troops and anti-independence militias, and 260,000 people fled westward. Over the next three years a massive international program led by the UN, manned by civilian advisers, 5,000 peacekeepers (8,000 at peak) and 1,300 police officers, led to substantial reconstruction in both urban and rural areas. By mid-2002, all but about 50,000 of the refugees had returned. This successful UN effort was headed by Special Representative of the Secretary-General, Sérgio Vieira de Mello, later to become High Commissioner for Human Rights, who was killed in Baghdad in August 2003. The country faces great challenges in continuing to rebuild the infrastructure and strengthen the infant civil administration. One promising long-term project is the joint development with Australia of petroleum and natural gas resources in the waters southeast of Timor. The Portuguese colonial administration granted a concession to Oceanic Exploration Corporation, [NASDAQ: OCEX.OB] of Denver, Colorado, to develop the petroleum deposits of the Timor Sea. Before the concession could begin to be developed, the Indonesian invasion made it impossible. Timor Sea petroleum resources were divided between Indonesia and Australia by the Timor Gap Treaty in 1989 which established guidelines for joint exploitation of seabed resources in the area of the "gap" left by then-Portuguese Timor in the maritime boundary agreed between the two countries in 1972. Revenues from the "joint" area were to be divided 50%-50%. Woodside Petroleum and ConocoPhillips began development of some resources in the Timor Gap on behalf of the two governments in 1992. OCEX currently has a $30B lawsuit against ConocoPhillips pending in US District Court in New York. This lawsuit is the company's sole significant asset; to fund the suit, it relies on the deep pockets of its majority owner, James Neal Blue, who also owns General Atomics (maker of the RQ-1 Predator drone aircraft). East Timor inherited no permanent maritime boundaries when it attained independence, repudiating the Timor Gap Treaty as illegal. A provisional agreement (the Timor Sea Treaty, signed when East Timor became independent on 20 May 2002) defined a Joint Petroleum Development Area (JPDA), and awarded 90% of revenues from existing projects in that area to East Timor and 10% to Australia. The first significant new development in the JPDA since Timorese independence is the largest petroleum resource in the Timor Sea, the Greater Sunrise gas field. Its exploitation was the subject of separate agreements in 2003 and 2005. Only 20% of the field lies within the JPDA and the rest in waters not subject to the treaty (though claimed by both countries). The initial, temporary agreement gave 82% of revenues to Australia and only 18% to East Timor. The Government of East Timor has sought to negotiate a definite boundary with Australia at the halfway line between the countries, in accordance with the United Nations Convention on the Law of the Sea. The Government of Australia preferred to establish the boundary at the end of the wide Australian continental shelf, as agreed with Indonesia in 1972 and 1991. Normally a dispute such as this could be referred to the International Court of Justice or the International Tribunal for the Law of the Sea for an impartial decision, but the Australian government had withdrawn itself from these international jurisdictions (solely on matters relating to maritime boundaries) shortly before Timorese independence. Nevertheless, under public and diplomatic pressure the Australian government offered instead a last-minute concession on Greater Sunrise gas field royalties alone. On July 7, 2005, an agreement was signed under which both countries would set aside the dispute over the maritime boundary, and East Timor would receive 50% of the revenues (estimated at A$26 billion or about US$20 billion over the lifetime of the project ) from the Greater Sunrise development. Other developments within waters claimed by East Timor but outside the JPDA (Laminaria-Corallina and Buffalo) continue to be exploited unilaterally by Australia, however. East Timor also has a large and potentially lucrative coffee industry, which sells organic coffee to numerous Fair Trade retailers and on the open market. Currently three foreign banks have a branch in Dili: Australia's ANZ, Portugal's Banco Nacional Ultramarino, and Indonesia's Bank Mandiri. East Timor has the lowest per capita income in the world (USD 400 per annum) according to the CIA World Factbook, 2005. The population of East Timor is about one million. It has grown considerably recently, because of a high birth rate, but also because of the return of refugees. The population is especially concentrated in the area around Dili. The Timorese are called Maubere collectively by some of their political organizations, an originally derogatory name turned into a name of pride by Fretilin. They consist of a number of distinct ethnic groups, most of whom are of mixed Malayo-Polynesian and Melanesian/ Papuan descent. The largest Malayo-Polynesian ethnic groups are the Tetun (or Tetum) (100,000), primarily in the north coast and around Dili; the Mambae (80,000), in the central mountains; the Tukudede (63,170), in the area around Maubara and Liquiçá; the Galoli (50,000), between the tribes of Mambae and Makasae; the Kemak (50,000) in north-central Timor island; and the Baikeno (20,000), in the area around Pante Macassar. The main tribes of predominantly Papuan origin include the Bunak (50,000), in the central interior of Timor island; the Fataluku (30,000), at the eastern tip of the island near Lospalos; and the Makasae, toward the eastern end of the island. In addition, like other former Portuguese colonies where interracial marriage was common, there is a smaller population of people of mixed Timorese and Portuguese origin, known in Portuguese as mestiços. The East Timorese mestiços best-known internationally are Xanana Gusmão, the resistance fighter and national hero, and now President of East Timor; and José Ramos Horta, the spokesman for the resistance movement in exile, and now Prime Minister of East Timor. Mário Viegas Carrascalão, Indonesia's appointed governor between 1987 and 1992, is also a mestiço. East Timor has also tiny Chinese and pure-blooded Portuguese minorities (most of them left the area after the Indonesian invasion). Upon independence, East Timor became one of only two predominantly Roman Catholic Christian countries in Asia (along with the Philippines). The population predominantly identifies as Roman Catholic (90%), though local animist traditions have a persistent and strong influence on the culture. Religious minorities include Muslims (5 per cent), including former Prime Minister of East Timor Mari Alkatiri, and Protestants (3 per cent). Smaller Hindu, Buddhist and traditional animist minorities make up the remainder. Church membership grew considerably under Indonesian rule, as Indonesia's state ideology Pancasila does not recognize traditional beliefs and requires all citizens to believe in God. Although the struggle was not about religion, as a deep-rooted local institution, the Church not only symbolized East Timor's distinction from predominantly Muslim Indonesia, but also played a significant role in the resistance movement, as personified by Bishop Carlos Filipe Ximenes Belo, the 1996 Nobel Peace Prize laureate. (See also the Liquiçá Church Massacre). The constitution acknowledges the Church's role among the East Timorese people although it also stipulates a secular state that guarantees freedom of religion to everyone. East Timor's two official languages are Portuguese and Tetum, a local Austronesian language. The predominant form of Tetum, known as Tetun-Dili, grew out of the dialect favored by the colonizers at Dili, and thus has considerable Portuguese influence, but other dialects of Tetum are also widely used in the country, among which Tetun-Terik along the southwestern coast. Indonesian and English are defined as working languages under the Constitution in the Final and Transitional Provisions, without setting a final date. Although the country has only about 1 million inhabitants, another fifteen indigenous languages are spoken: Bekais, Bunak, Dawan, Fataluku, Galoli, Habun, Idalaka, Kawaimina, Kemak, Lovaia, Makalero, Makasai, Mambai, Tokodede and Wetarese. Under Indonesian rule, the use of Portuguese was banned, but it was used by the clandestine resistance, especially in communicating with the outside world. The language, along with Tetum, gained importance as a symbol of resistance and freedom and was adopted as one of the two official languages for this reason, and as a link to nations in other parts of the world. It is now being taught and promoted widely with the help of Brazil, Portugal and the Latin Union, although its prominence in official and public spheres has been met with some hostility from younger Indonesian-educated Timorese. According to the 2006 UN Development Report (using data from official census), under 5% of the Timorese population is literate in Portuguese. However, the validity of this report has been questioned by members of the Timorese National Institute of Linguistics , which maintains that Portuguese is spoken by up to 25% of Timorese, with the number of speakers more than doubling in the last five years. Along with other local languages, Tetum remains the most common means of communication between ordinary Timorese, while Indonesian is still widely used in the media. A large proportion of words in Tetum are derived from Portuguese, but it also shares many Malay-derived words with Indonesian. Many Indonesian words are still in common use in Tetum and other Timorese languages, particularly numbers. East Timor is a member of the Community of Portuguese Language Countries ( CPLP), also known as the Lusophone Commonwealth, and a member of the Latin Union. It is the only independent state in Asia with Portuguese as an official language, although this is also one of the official languages of China's Special Administrative Region of Macau. The culture of East Timor reflects numerous influences, including Portuguese, Roman Catholic, and Malay, on the indigenous Austronesian and Melanesian cultures of Timor. Legend has it that a giant crocodile was transformed into the island of Timor, or Crocodile Island, as it is often called. East Timorese culture is heavily influenced by Austronesian legends, although the Catholic influence is also strong. Illiteracy is still widespread, but there is a strong tradition of poetry. President Xanana Gusmão, for example, is a distinguished poet. As for architecture, some Portuguese-style buildings can be found, along with the traditional totem houses of the eastern region. These are known as uma lulik (sacred houses) in Tetum, and lee teinu (houses with legs) in Fataluku. Craftsmanship is also widespread, as is the weaving of traditional scarves or tais. East Timor has joined many international sport associations, including the International Olympic Committee (IOC). The IOC board has granted full recognition to the East Timorese Olympic Committee (COTL). The IOC had allowed a mainly symbolic four-member team to take part in the 2000 Sydney Games under the Olympic flag as "Independent Olympic Athletes." The Federação de Timor-Leste de Atletismo has joined the International Association of Athletics Federations (IAAF). The Federação de Badminton de Timor-Leste joined the International Badminton Federation (IBF) in April 2003. The East Timor Cycling Federation has joined the Union Cycliste Internationale. The Confederação do Desporto de Timor Leste has joined the International Weightlifting Federation. East Timor is also a full member of the International Table-Tennis Federation (ITTF). In September 2005, East Timor's national football team joined FIFA. East Timor has taken part in several sporting events. In the 22nd SEA Games, held in Vietnam in 2003, although the athletes came back with no medals, the athletes were happy to have the opportunity to perform and compete with the best athletes coming from Southeast Asian countries. The equipment of the athletes were lent to them by nations of Southeast Asia, such as Malaysia. In the 2003 ASEAN Paralympics Games, also held in Vietnam, a bronze medal was won by East Timor. In the Athens 2004 Olympic Games, six athletes participated in three sports (athletics, weightlifting and boxing). On East Timor's performance in the 22nd SEA Games in 2003, karate coach Austo Aparício remarked, "This was an opportunity for our athletes to gain experience. East Timor is still young, so it has lots of financial problems." He also commented on his team's karate performance, "We are fairly good at karate and we can make sure that we win a medal in the Philippines, in 2005."